One thing I personally hate in songs in unnecessary talky bits, especially mushy ones. Ooh just the thought of it , get me a bucket please! A couple of examples are The Girl Is Mine by Paul McCartney and Michael Jackson (I’m a lovers not a fighter- aargh!) and middle section of The Chi-Lites’ Have You Seen Her (although the intro bit is not too bad as it builds the story), but to me, the most nauseating song is the section in the middle of Who Put The Bomp (In The Bomp, Bomp, Bomp) when, in the most insincerest voice you’ve ever heard, he says – ‘Darlin’, Bum-ba-ba-bum, bum-ba-ba-bum-bum-bum, and my honey rama lama ding dong forever, and when I say dip-dip da dip da dip, you know I mean it from the bottom of my boogidy boogidy boogidy shoo’. WTF? I have never said to any belle of my affections ‘Honey, rama lama ding dong’ – they would have run a bloody mile. Now I come to think of it, there were a couple of female I perhaps should have tried it on! Barry was born Barry Imberman in February 1939 and has written, to date, 52 UK hit singles, the majority with his wife Cynthia Weil. His name first appeared on the Billboard singles chart in 1959 as writer of the Diamonds’ hit She Say (Oom Dooby Doom), in the UK, his debut his was as co-writer of Alma Cogan’s number 26 hit We Got Love. Bigger hits soon followed, Footsteps by Steve Lawrence and Counting Teardrops by Emile Ford & the Checkmates both reached number four in 1960, but without doubt, his biggest hit, and the one that elevated his bank balance into the stratosphere was the most played song on American radio – You’ve Lost That Lovin’ Feelin’. 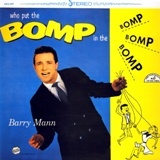 Barry teamed up with Carole King’s future husband, Gerry Goffin, for the novelty song Who Put The Bomp (In The Bomp, Bomp, Bomp) which was full of nonsense words, most of which were featured in the doo-wop songs of the day. The majority of the lyrics were gibberish, as indicated above, but were mocking, in a friendly way, other songwriters, for example, the bomp ba ba bomp ba bomp ba bomp bomp parodied Blue Moon, rama lama ding dong was not only the lyric, but also the title of a hit by the Edsels (covered in the 70s by Rocky Sharp & The Replays) and the boogity boogity shoo is lifted from Chubby Checker’s Pony Time. Barry was a famed Brill Building writer but this was his only major hit as an artist and wasn’t originally supposed to be him. Carole King and Gerry Goffin were both present in the studio, but before they attempted the first take, it was decided that they needed a doo-wop backing band. So another up and coming songwriter at the time, Jack Keller, auditioned a group in the Brill Building, they were the Halos, the same people who provided the backing for Curtis Lee’s original version of Pretty Little Angel Eyes. They were brought to the studio and Carole King was given the first opportunity at the microphone, but within two bars Gerry yelled from the control room, ‘Enough, she’s ruining the song.’ Eventually Barry took to the mic and the recording was done. It was released in America on the ABC-Paramount label and made number seven. In the UK, a Tony Hatch- produced cover by the Viscounts peaked at number 21. Naturally Showaddywaddy got hold of it in 1982 but their version fizzled out at number 37. Barry stuck to what he did best, songwriting and over the next 50 years has written some of the most memorable hits including, We’ve Got To Get Out Of This Place (Animals), It’s Getting Better (Mama Cass), I Just Can’t Help Believin’ (Elvis Presley), Come On Over to My Place (Drifters), Sometimes When We Touch (Dan Hill), Somewhere Out There, From The Movie An American Tail (Linda Ronstadt & James Ingram) and Don’t Know Much (Linda Ronstadt & Aaron Neville). In 1987 Barry and Cynthia were inducted into the Songwriters Hall of Fame and in 2011, they received the Johnny Mercer Award from the Songwriters Hall of Fame which is probably the greatest accolade that a songwriter can be awarded. The couple are still writing and currently own their own publishing company called Dyad Music. Barry occasionally goes out on the road as a one-man show and performs a stack of his catalogue and telling the stories behind them. One he likes to talk about is the song that features on this week’s YouTube clip of the week, the awesome Just Once by James Ingram.